Counselor of the Year, free breakfasts for test takers, and more! Video: How Can Schools Support Underrepresented Students? Thank you for your submission. You're now signed up to receive the monthly Counselor Newsletter via email. You may close this dialog at any time. Brian Coleman has a strong message for students about individuality. “You are worth love, dignity, empathy, and compassion JUST as you are," he says. "So, why not be yourself?" Coleman, counseling department chair at Jones College Prep in Chicago, was named 2019 School Counselor of the Year (PDF) by the American School Counselor Association—the first African American to receive the award. ACT spoke with Coleman about challenges facing counselors, the impact of effective counseling, and lessons he’s learned in his position. Coleman says individualism and self-care aren’t just for students—they’re key attributes that strengthen a counselor’s connection with those students. ACT research has shown that students who eat breakfast before taking the ACT® test tend to achieve better scores than students who did not eat. A grassroots initiative at one Kentucky school is helping students arrive at test day on time and with full stomachs. Iroquois High School in Louisville has a large population of English language learners and other students with exceptional needs. To entice students to attend school on ACT test days, Iroquois began an initiative “to break common barriers to student success,” says Clay Hollister, building assessment coordinator at Iroquois. Ask the Expert: What Can Schools Do to Support Underrepresented Students? Some educators base student support decisions on what they observe from the student in the classroom when they should, in fact, use a much wider scope. External factors such as family, economic status, and hunger can play huge roles in students’ well-being and their performance in class. In our latest “Ask the Expert” video, Juan Garcia of the ACT Center for Equity in Learning stresses the importance of knowing students’ backgrounds and their lives outside the classroom. Knowing whether a student has a solid support system outside of school can help determine the student’s path within its walls. The recent ACT STEM report showed that a confidence gap often puts girls behind the curve for STEM-related careers. The ACT Leadership Blog, however, describes a partnership that could change things for the better. Texas Instruments and the TI Foundation are teaming with the Girl Scouts of America to introduce its members to STEM futures. The groups have donated funds to the Girl Scouts organization for STEM initiatives and created the STEM Center of Excellence in Dallas, which gives girls a place to hone their STEM-related skills. One project prompts girls to work with architects and engineers to build structures made of Girl Scout cookie boxes, encouraging critical thinking, cooperation, and team-building skills. Preparing students with ACT-recommended tips on self-pacing, fully comprehending the questions and answer choices, and using precision and logic in their responses can make a huge difference in their comfort levels while taking the test, which can lead to achieving their best scores. A free webinar from ACT describes key strategies you can share with students to help them do their best on test day. Watch the webinar to hear from representatives at Sheridan High School in Arkansas, which recently launched a unique program to boost school-wide performance on the ACT test centered on helping students fully realize the value of taking a college admissions exam and tracking students’ readiness, step by step, leading up to test day. 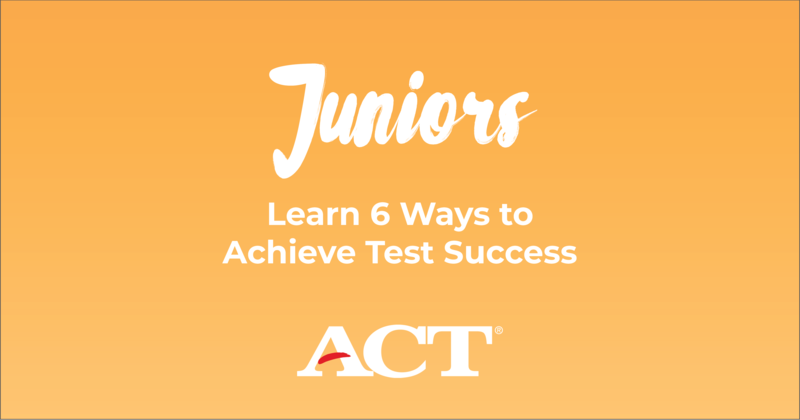 Students can get a taste of what’s waiting for them on test day with a free practice test from ACT, along with helpful information and tips to help boost their confidence while taking the ACT test—all for free! How Much Do You Know About ACT Test Accommodations? ACT is committed to serving examinees with documented disabilities by providing reasonable accommodations appropriate to the examinee's diagnosis and needs. ACT has established policies regarding documentation of an examinee’s disability. ACT recognizes the need to expand access to English learners. ACT provides supports on the ACT test to US students who are English learners. These supports are designed to improve access and equity for students whose proficiency in English might prevent them from fully demonstrating the skills and knowledge they have learned in school. The number of English learners is growing in our country, and ACT is committed to improving access and opportunity for them and all underserved learners. Click on the link below to watch training videos and read ACT policies and user guides about ACT test accommodations. Don’t lose hope if financial aid and cost savings haven’t covered everything. There are ways to help make higher education accessible. 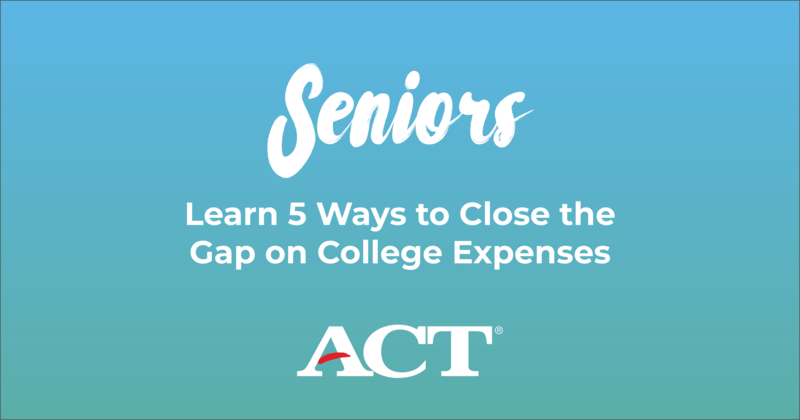 When it comes to preparing for the ACT, there’s no magic solution. However, there are several things you can do to achieve the score you want. Junior year is right around the corner. 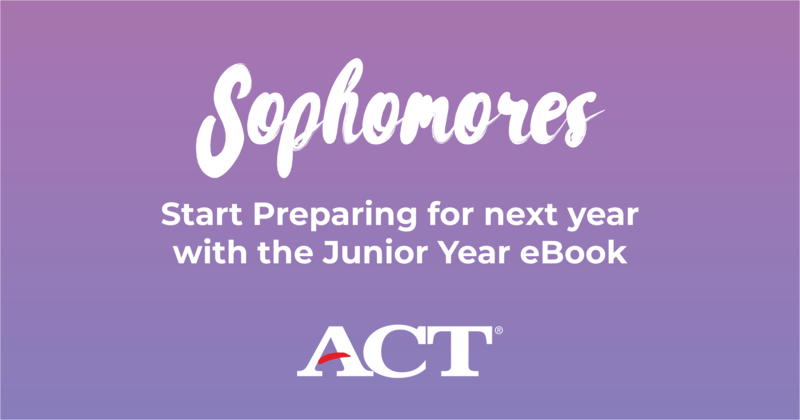 Begin mapping out ways to prepare for next year by asking yourself the 5 main questions highlighted in our Junior Year eBook.